In the computing industry, capacitive touchscreens are most commonly utilized as a form of Human Machine Interface (HMI) technology, frequently employed to control equipment. Both capacitive and resistive touchscreen computers are becoming increasingly common in industrial applications as they offer an intuitive interface for machine operators. Capacitive touchscreens rely on the human body's electrical properties to identify where the user is touching the screen. Capacitive touchscreen panels consist of an insulator such as glass, coated with a transparent conductor. 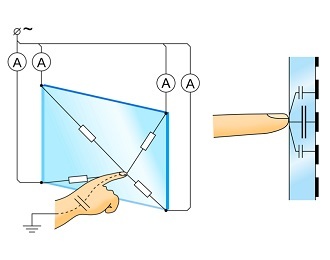 As the human body is also an electrical conductor, touching the surface of the screen results in a distortion of the screen's electrostatic field, measurable as a change in capacitance. The location of the distortion is then sent to the controller for processing. Because capacitive touchscreens rely on direct contact with bare skin, they generally cannot be used by operators wearing gloves. However, capacitive touchscreens do offer the benefits of better touch location accuracy and can be activated with even the slightest touch. Capacitive touchscreens also enable multi-touch capability while resistive touchscreens can generally only detect a single point of contact. Where are Capacitive Touchscreens Used? Capacitive touchscreens are becoming increasingly popular across a number of industries due to their ease of use, but kiosks and interactive digital signage are two of the more common implementations. Capacitive touchscreens are frequently used for installations that require highly accurate touch sensing or multi-touch capabilities such as pinch to zoom.